North America, the world's third-largest continent, encompasses an area of about 9,400,000 square miles (24,346,000 square kilometers). This landmass is occupied by the present-day countries of Canada, the United States, Mexico, Guatemala, Belize, El Salvador, Honduras, Nicaragua, Costa Rica, and Panama. Also included in the North American continent are Greenland, an island landmass northeast of Canada, and the islands of the Caribbean, many of which are independent republics. North America is bounded on the north by the Arctic Ocean, on the west by the Bering Sea and the Pacific Ocean, on the south by the South American continent, and on the east by the Gulf of Mexico and Atlantic Ocean. on Earth, from polar conditions in Greenland to tropical rain forests in the countries of Central America. Much of the continent, however, is subject to a temperate climate, resulting in favorable farming and living conditions. The highest point on the continent is Mount McKinley in Alaska, standing 20,320 feet (6,194 meters) in height. Badwater, in the south-central part of Death Valley in California, is the continent's lowest point, at 282 feet (86 meters) below sea level. The North American continent contains the world's greatest inland waterway system. The Mississippi River rises in northern Minnesota and flows 2,348 miles (3,778 kilometers) down the center of the United States to the Gulf of Mexico. The Missouri River, formed by the junction of three rivers in southern Montana, runs 2,466 miles (3,968 kilometers) before it joins the Mississippi just north of St. Louis, Missouri. The Ohio River, formed by the union of two rivers at Pittsburgh, Pennsylvania, flows 975 miles (1,569 kilometers) before emptying into the Mississippi at Cairo, Illinois. The Mississippi, with all of its tributaries, drains 1,234,700 square miles (3,197,900 square kilometers) from all or part of 31 states in the United States. From the provinces of Alberta and Saskatchewan in Canada, the Mississippi drains about 13,000 square miles (33,670 square kilometers). Other chief rivers in North America include the Yukon (Alaska and Canada); Mackenzie, Nelson, and Saskatchewan (Canada); Columbia and St. Lawrence (Canada and U.S.); Colorado, Delaware, and Susquehanna (U.S.); and Rio Grande (U.S. and Mexico). North America contains more lakes than any other continent. Dominant lakes include Great Bear, Great Slave, and Winnipeg (Canada); the Great Lakes (Canada and U.S.); Great Salt Lake (U.S.); Chapala (Mexico); and Nicaragua (Nicaragua). The Great Lakes, a chain of five lakes, are Superior, Michigan, Huron, Erie, and Ontario. Superior, northernmost and westernmost of the five, is the largest lake in North America and the largest body of freshwater in the world. Stretching 350 miles (560 kilometers) long, the lake covers about 31,820 square miles (82,410 square kilometers). It has a maximum depth of 1,302 feet (397 meters). 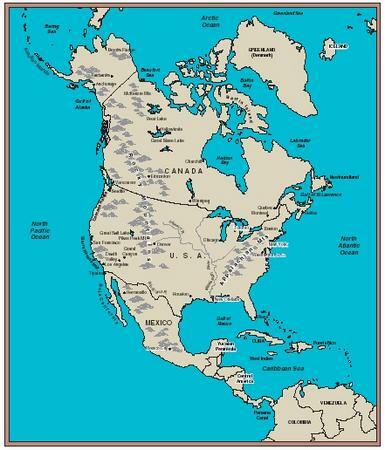 Geologists divide the North American continent into a number of geographical regions. The five main regions are the Canadian Shield, the Appalachian System, the Coastal Plain, the Central Lowlands, and the North American Cordillera (pronounced kor-dee-YARE-ah; a complex group of mountain ranges, systems, and chains). Canadian Shield. The Canadian Shield is a U-shaped plateau region of very old, very hard rocks. It was the first part of North America to be elevated above sea level, and became the central core around which geological forces built the continent. It is sometimes called the Laurentian Plateau. It extends north from the Great Lakes to the Arctic Ocean, covering more than half of Canada and including Greenland. Hudson Bay and Foxe Basin in Canada mark the center of the region, submerged by the weight of glaciers of the most recent ice age some 11,000 years ago. Mountains ranges ring the outer edges of this geological structure. In the United States, the Adirondack Mountains and the Superior Highlands are part of the Shield. The southern part of the Canadian Shield is covered by rich forests, while the northern part is tundra (rolling, treeless plains). The region is rich in minerals, including cobalt, copper, gold, iron, nickel, uranium, and zinc. Appalachian System. The Appalachian Mountains extend about 1,600 miles (2,570 kilometers) southwest from Newfoundland to Alabama. They are a geologically old mountain system. Formed over 300 million years ago, the Appalachians have eroded greatly since then. Most of the system's ridges are 1,200 to 2,400 feet (360 to 730 meters) in height. Only a few peaks rise above 6,000 feet (1,800 meters). The system's highest peak, Mount Mitchell, rises 6,684 feet (2,037 meters) above sea level. The main ranges in the system are the White Mountains (New Hampshire), Green Mountains (Vermont), Catskill Mountains (New York), Allegheny Mountains (Pennsylvania), Great Smoky Mountains (North Carolina and Tennessee), Blue Ridge Mountains (Pennsylvania to Georgia), and the Cumberland Mountains (West Virginia to Alabama). Much mineral wealth is found throughout the Appalachian System, including coal, iron, lead, zinc, and bauxite. Other mineral resources such as petroleum and natural gas are also prevalent. Coastal Plain. 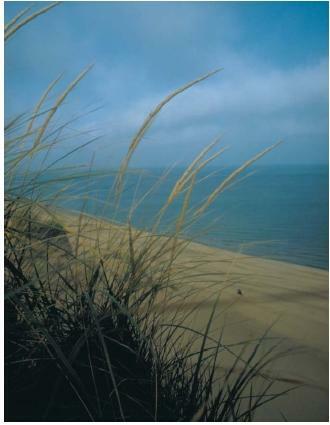 The Coastal Plain is a belt of lowlands that extends from southern New England to Mexico's Yucatan Peninsula, flanking the Atlantic Ocean and the Gulf of Mexico. This geological area was the last part added to the North American continent. Much of the plain lies underwater along the northern Atlantic Coast, forming rich fishing banks. The southern portion of the plain, from Florida along the Gulf shore of Louisiana and Texas into Mexico, holds large deposits of phosphate, salt, and sulfur. Extensive oil and natural gas fields also line this area. Central Lowlands. The Central Lowlands extend down the center of the continent from the Mackenzie Valley in the Northwest Territories in Canada to the Coastal Plain in the Gulf of Mexico. These lowlands circle the Canadian Shield. Included in this extensive region are the Great Plains in the west and the lowlands of the Ohio-Great Lakes-Mississippi area in the east. The great North American rivers are contained in this region, making the surrounding soil fertile for farming. The world's richest sources of coal, oil, and natural gas are also found here. North American Cordillera. The North American Cordillera is a complex group of geologically young mountains that extend along the western edge of the North American continent. The eastern section of the Cordillera is marked by the Rocky Mountains. They extend more than 3,000 miles (4,800 kilometers) from northwest Alaska to central New Mexico. The highest peak in the Rockies is Mount Elbert in Colorado at 14,431 feet (4,399 meters) in height. The highest peak in the Canadian Rockies is Mount Robson in eastern British Columbia, rising 12,972 feet (3,954 meters). The ridge of the Rocky Mountains is known as the Continental Divide, the "backbone" of the continent that separates the rivers draining to the Arctic and Atlantic Oceans from those draining to the Pacific Ocean. The Rockies may be divided into three sections: northern, central, and southern. The Northern Rockies, which rise to great elevations, begin in northern Alaska and extend down into Montana. From here, the Central Rockies extend down into Colorado. A high, vast plateau separates the Central Rockies from the Southern Rockies. Known as the Wyoming Basin, it varies in elevation from 7,000 to 8,000 feet (2,100 to 2,400 meters). The Southern Rockies contain the highest peaks in the entire system—many exceed 14,000 feet (4,300 meters) in height. West of the Rockies lies a series of plateaus and basins. These include the Yukon Plateau, the uplands in central British Columbia, the Snake River Plain, the Great Basin, and the Colorado Plateau. The Great Basin, an elevated region between the Wasatch and Sierra Nevada Mountains, includes the Great Salt Lake, the Great Salt Lake and Mojave deserts, and Death Valley. The western edge of North America is marked by two mountain ranges: the Cascade and Coast ranges. The Cascade Range extends about 700 miles (1,130 kilometers) from British Columbia through Washington and Oregon into northeast California. Many of the range's peaks are volcanic in origin. The highest peak is Mount Rainier in Washington, standing 14,410 feet (4,390 meters) in height. North of the Cascades are the Coast Mountains, which extend about 1,000 miles (1,610 kilometers) north from British Columbia into southeast Alaska. Here they are met by the Alaska Range, which extends in a great arc through south-central Alaska. This range features the highest peaks in North America, including Mount McKinley. South of the Cascades are the Sierra Nevada Mountains, extending about 400 miles (640 kilometers) through eastern California. The Sierras, noted along with the Cascades for their beauty, contain Mount Whitney. 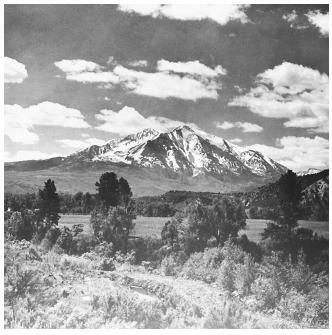 At 14,494 feet (4,418 meters) tall, it is the highest peak in the contiguous United States (the 48 connected states). The Coast Ranges are a series of mountain ranges along North America's Pacific coast. They extend from southeast Alaska to Baja California. The ranges include the St. Elias Mountains (Alaska and Canada); Olympic Mountains (Washington); Coast Ranges (Oregon); Klamath Mountains, Coast Ranges, and Los Angeles Ranges (California); and the Peninsular Range (Baja California). Peaks in the entire Coast Ranges extend from 2,000 to 20,000 feet (610 to 6,100 meters) in height. In Mexico, the chief mountain system is the Sierra Madre, composed of the Sierra Madre Occidental, the Sierra Madre Oriental, and the Sierra Madre del Sur. The Sierra Madre Occidental begins just south of the Rio Grande River and runs about 700 miles (1,130 kilometers) parallel to the Gulf of Mexico. The Occidental contains the highest peak in the Sierra Madre system, Pico de Orizaba, which rises to 18,700 feet (5,700 meters). Orizaba is also considered a part of the Cordillera de Anahuac, an east-west running belt of lofty volcanoes just south of Mexico City. In addition to Orizaba, this belt contains the volcanic peaks Popocatepetl and Ixtacihuatl. The belt connects the Occidental range to the Sierra Madre Oriental, which runs south from Arizona parallel to the Pacific coast for about 1,000 miles (1,610 kilometers). The Sierra Madre del Sur is a broken mass of uptilted mountains along the Pacific coast in southern Mexico. It forms the natural harbor of Acapulco. great article ! i almost complete my homeworks! time and effort saving !! keep it up ! i love it ! and i learned a lot of things bout north america ..thanks ! OMG! Thanks! I really needed to know if Greenland was part of North America! This was sooo helpful! Thanks again! this website rocks and gives me lots of info on cool stuff like states and diffrent kinds of stuff thank you very much fo creating this website.!!!!!!!!!!!!!!!!! Hey this article is awesome all the things i couldnt find somewhere else i found them here!! i am so glad i hope i get an A on my report!! THANKS A LOT!!! Contains excellent information useful for my research work. This is a heavenly storage of information, comprising of a multitude of knowledge I just couldn't get. Thanks a lot.